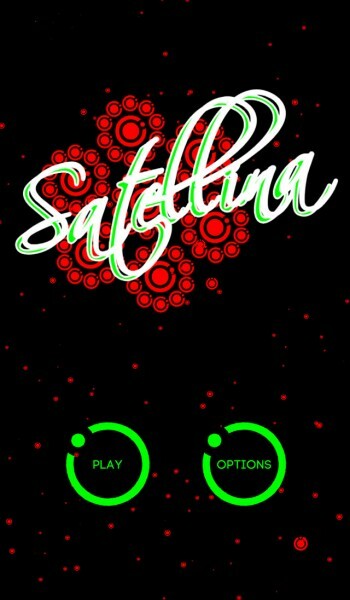 Satellina ($1.99) by Peter Smith is a challenging puzzle-in-motion game that is simple to learn but difficult to master. If you enjoyed games like Circadia and Color Zen, then you’ll like Satellina. When it comes to mobile games, I prefer the quick-play puzzle games that I can just pick up and play in short bursts throughout the day. They’re just better suited for mobile lifestyles, and it’s always fun to see what the developers come up with. That’s why Satellina caught my eye this week in my perusal of the App Store — this is a game that isn’t like most of the puzzle games you’ll find in the market now. 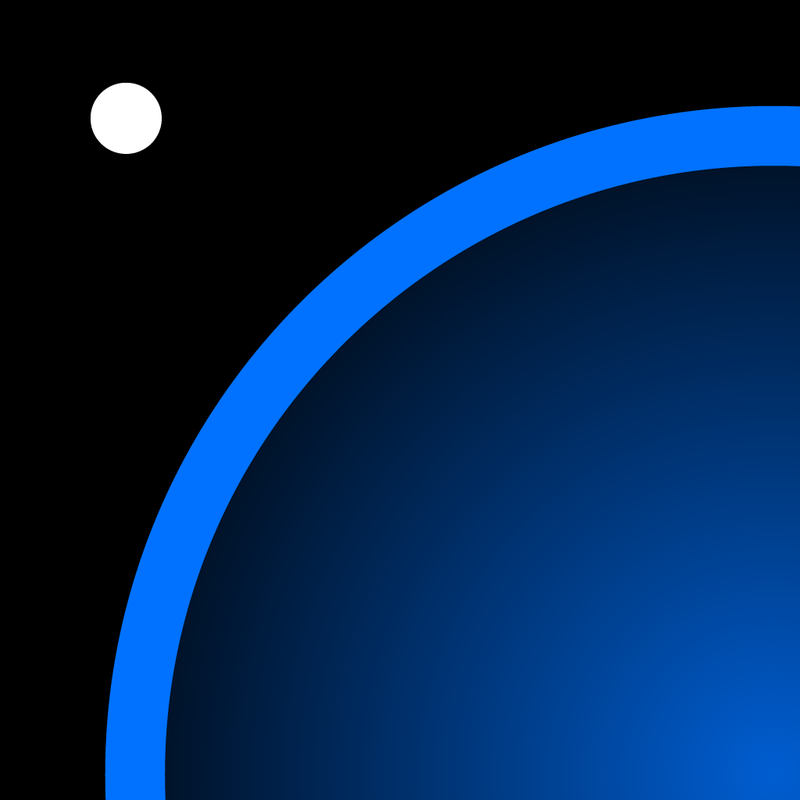 The visuals in Satellina are simple, but elegant, as the game consists of basic shapes, like circles, that are part of something bigger, like stars, squares, and more. The colors in Satellina consist of just primary colors, all of which contrast very well with the black background. The default colors are green, yellow, and red, but players can change to alternative palettes, which will be useful for those who are colorblind. Animations are nice and smooth, and the original 11-track synthpop soundtrack is upbeat and catchy. 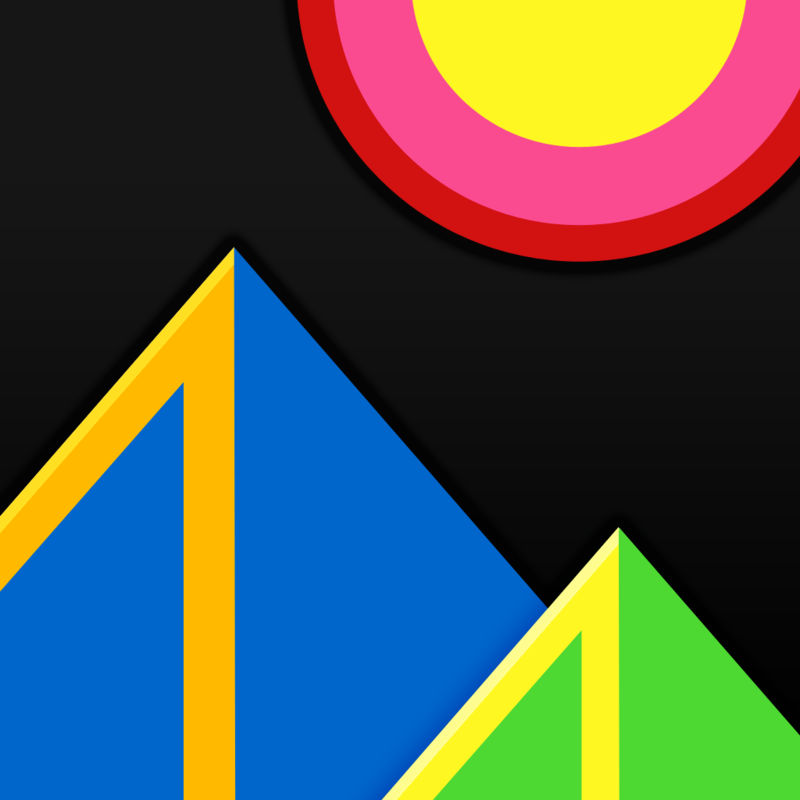 Satellina features 50 levels that are split up among level packs that branch out in difficulty. You start with the first chapter, which is named “A,” and then the path forks off into multiple sectors. Some routes will be easier than others, and the game will tell you which direction to go if you want something undemanding or a challenge. With this in mind, the learning curve in Satellina can be gradual or intense, but always enjoyable. Regardless of which way you go, when you choose a pack of levels, you will need to clear several waves in succession before you can advance. 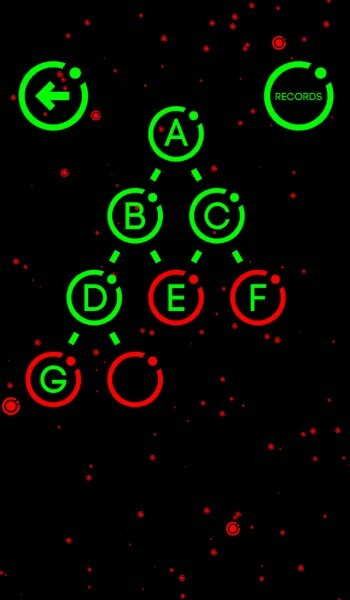 The controls in the game are simple and intuitive. You are in control of the white circle with the “x” in the center of it. 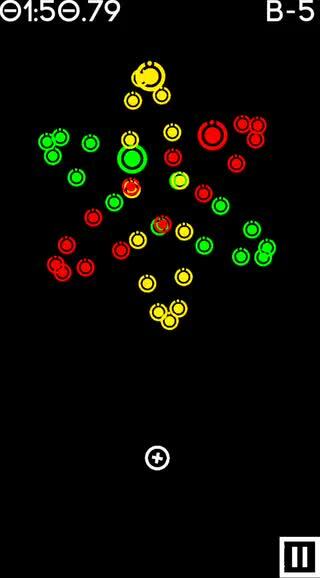 To move around on the screen, just drag your finger around and your circle will follow. 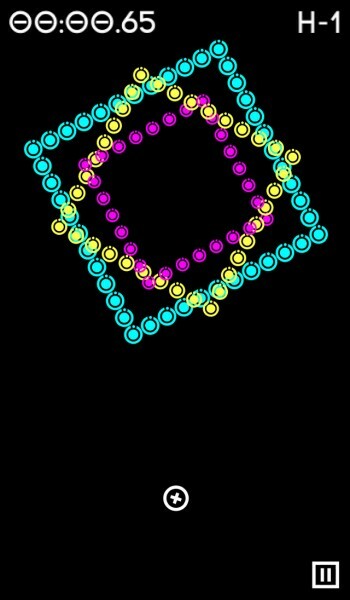 While you can touch the circle and then drag, this will result in your finger obstructing your view. With this in mind, it’s recommended to just move your finger around on the screen to control the circle, and not directly on top of it, so you get a clear view of the screen. 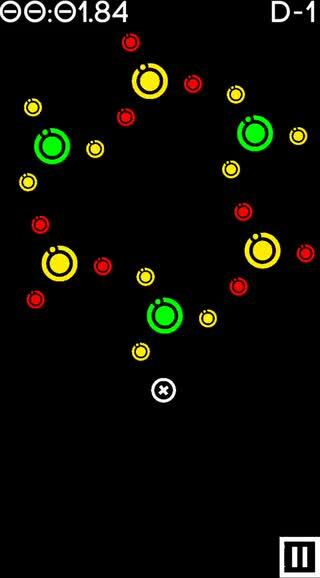 In Satellina, the goal of the game is to have your circle touch the green ones, but this proves to be difficult as the puzzles are always moving. 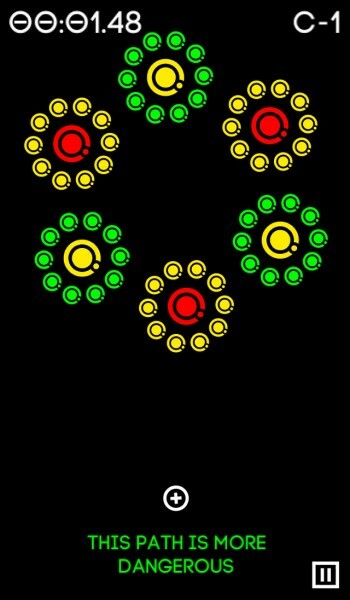 Once you collect the green circles, then the yellow ones become green, and you collect those, repeating the process until you gather up all of the moving circles. If you run into a different color, then you have failed and will need to restart. Each stage is timed too, so you have to be fast — there’s no time to waste. 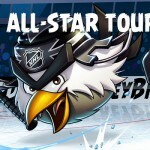 While the game sounds simple, it is far from it, especially as you advance in levels. Things move faster, the circles are smaller, there are more of them to collect — all of these obstacles make the game challenging, and it’s part of the charm. Additionally, there are bonus modes, secrets, and even more color schemes to unlock if you’re good enough. Satellina also has global leaderboards, though it seems that this is done in-house and not through Game Center, oddly enough. Your ranking depends on how fast you are able to complete the entire set of puzzles for a pack. I always enjoy puzzle games like this, and Satellina is unique and challenging enough to stand out in the App Store. The visuals are fantastic and retro in a way, the music is delightful, and the controls are intuitive. I recommend giving Satellina a try if you’re in the mood for a puzzle that puts your reflex skills to the test. Satellina can be found on the App Store as a universal download for $1.99.